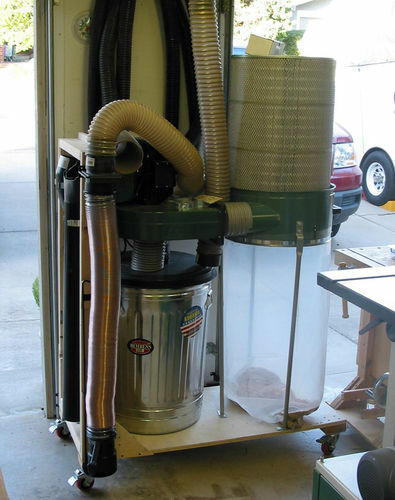 I have been using a single stage dust collection system for over a year now and have found that the bottom bag fills up quickly and the top filter bag gets really messy. I finally upgraded to a two stage system and it works great. The lid I use has two ports and the port that connects to the tool has an L-shaped elbow that connects to the underside of the port. I have the lid on a heavy duty Rubbermaid garbage can but might upgrade to a deeper can sometime. After doing a bunch of planing and turning, there was only a tiny bit of dust in the bottom bag and nothing in the filter while all of the shavings were in the can. I have a couple of tips for maximum efficiency. 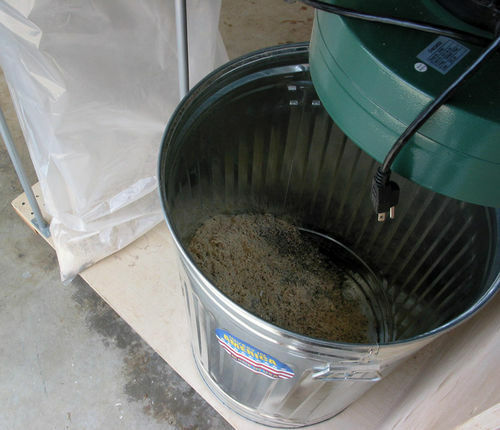 Make sure the elbow is angled more towards the side of the can for a better cyclone effect, use a thick gauge plastic or metal can as a thin one will collapse under the pressure of the dust collector, and as soon as you notice the collector is dragging chips into the bag that is the indicator when the can is full. So far I am impressed with the efficiency of this system and the can is a lot easier to empty than the plastic bag. I have one of these and I think they are great. Before I bought this it always bothered me when I heard a small scrap of wood, or anything hard, hit the fan blades. I don’t think any damage was done, but I still didn’t like the sound. With one of these, those hard items drop into the barrow before they hit the blades. Suggestion – A bungi cord across the can top connecting to both handles on the can will keep the top in place nicely. I had to change my bag for the first time on mine and Monday I will Getting one and a Metal can. As mentioned above as well, then I won’t have to worry something going into the floor sweep and hitting the blades. Nice Post! I have the same lid and it is working great. Hello Asher… a bunch of guys have converted their dust collectors in this way. I tried to link to most of them in my blog http://lumberjocks.com/newTim/blog/22009, Hot Rodding A Harbor Freight DC. In my blog you can see the evolution of my thinking and how I borrowed from others. There is also a chapter on the pros and cons of turning the motor 90 degrees to the horizontal position. For more info you can search LJs or Gogole “Hot Rodding Dust Collector” or other keywords and you will come up with a bunch of references. So far the collector is working great in all respects. The motor is doing fine. Other than shelling out $1k or so for a real setup, I think this is the way to go.